Background: Spinel ferrites have great scientific and technological significance because of their easy manufacturing, low cost and outstanding electrical and magnetic properties. Nickel ferrite nanoparticles are ferromagnetic material with an inverse spinel structure. They show remarkable magnetic properties and hence have a wide range of applications in magnetic storage devices, microwave devices, gas sensors, telecommunication, drug delivery, catalysis and magnetic resonance imaging. Objective: The aim and objective of this research article is to study the relative effect of NiErxFe2-xO4 nanoparticles and their composites with reduced graphene oxide (rGO) for the photocatalytic degradation reaction and other physical parameters. Method: Rare earth Er3+ substituted NiErxFe2-xO4 nanoparticles were synthesized via the facile wet chemical route. Six different compositions of NiErxFe2-xO4 with varied Er3+ contents such as (x) = 0.00, 0.005, 0.01, 0.015, 0.02 and 0.025 were selected for evaluation of the effect of Er3+ on various parameters of NiFe2O4 nanoparticles. Reduced graphene oxide (rGO) was prepared by Hummer’s method and was characterized by UV-Visible spectroscopy, X-ray powder diffraction and Raman spectroscopy. Nano-heterostructures of NiErxFe2-xO4 with rGO were prepared by the ultra-sonication method. Results: X-ray powder diffraction (XRD) confirmed the spinel cubic structure of all the compositions of NiErx- Fe2-xO4 nanoparticles. 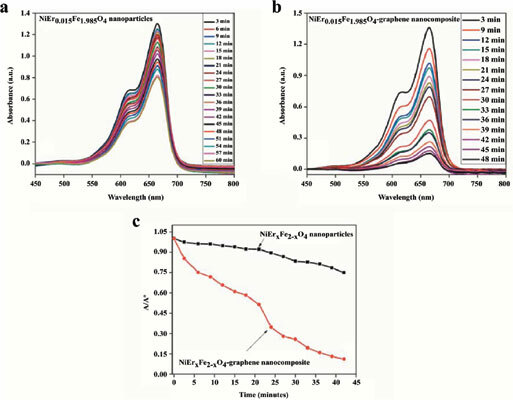 The photocatalytic degradation rate of methylene blue and congo red under visible light irradiation was found faster in the presence of NiErxFe2-xO4-rGO nanocomposites as compared to bare nanoparticles. It was also investigated that as the Er3+ contents were increased in NiErxFe2-xO4 nanoparticles, the dielectric parameters were largely affected. The room temperature DC-resistivity measurements showed that the Er3+ contents in NiFe2O4 are responsible for the increased electrical resistivity of ferrite particles. The electrochemical impedance spectroscopic (EIS) analysis of NiErxFe2-xO4 nanoparticles and NiErxFe2-xO4-rGO nanocomposites revealed that the ferrite particles possess low conductance as compared to the corresponding composites with graphene. Conclusion: The data obtained from all these characterization techniques suggested the potential applications of the NiErxFe2-xO4 nanoparticles and NiErxFe2-xO4-rGO nanocomposites for visible light driven photo-catalysis and high-frequency devices fabrication. Ferrites, spinel ferrites, Reduced Graphene Oxide (rGO), nano-heterostructures, photocatalysis, electrochemical impedance spectroscopy.